Being able to use the past and present tenses of English verbs correctly will help you to clearly express your actions. This upper-intermediate level English course will familiarize you with the different uses of verb forms, time words, and phrases in the English past and present tenses. You will learn about the different meanings and functions of the English past and present tenses as well as the role of subjects, verbs, and objects. This course will first introduce you to time words and phrases that will help you determine the verb tenses. You will learn how to use the present simple to talk about a fact such as 'I work in an office' and the present continuous to talk about things that are happening at a particular time such as 'I am writing a letter right now." You will also study how to form the present perfect and the present continuous tenses. Next, you will study verbs that describe states and actions as well as cover the past simple, past continuous, and past perfect tense. You will learn how to use the phrase 'used to' and the modal verb 'would' to describe states and habits in the past. You will also study how to use auxiliary verbs for emphasis, to show interest, to avoid repetition, and to form question tags. You will then learn the importance of intonation. This course is designed to teach upper-intermediate level English learners the past and present English verb tenses. It includes a short guide to writing with tips on how to prepare, lay out, and finish various writing tasks. This course also includes a section on pronunciation that includes information on how the tone and sound changes depending on the intentions of the speaker. So, check out the course and learn all this valuable knowledge today! Define the forms used in sentences using different Present tenses. List commonly used time words and phrases. Explain the use of modal verbs in sentences about the past and the present. Describe how we can talk about states, actions and habits using different tenses. Justify the differences in intonation and sound depending on the mood and motivation of the speaker. Prove how open and closed questions are effective in conversations. Relate the different purposes of using auxiliary verbs. 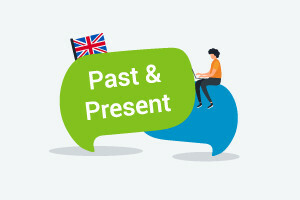 Review the use of subject and object in sentences using the Past and Present tenses.